“Sorry, I spent it on Myself”, a Harvey Nichols Christmas. This ad campaign has been running since the end of November for British retailer Harvey Nichols. The campaign focuses on the self indulgence that sometimes comes with the holiday season. The thing that I love about this though, is all of the horrid thoughtless gifts shown in the ad are available for purchase at Harvey Nichols. The “Sorry” campaign has a dedicated website, so you can buy yourself something nice with all the money you saved buying your grandmother paper clips. Posted in Advertising and tagged Advertising, Christmas, Gift Ideas, Gifts, Harvey Nichols, Integrated Campaign, Self Indulgence, Youtube on December 17, 2013 by Author. Case Study, the “Dumb Ways To Die” campaign. Earlier this year I posted the “Dumb Ways to Die” video along with additional information on the integrated campaign that was created around it. It is no surprise that the campaign won so many awards at the Cannes Lions 2013 Festival of Creativity. This video was the third most popular viral video of all time. Below is the full case study on just how successful the overall campaign was, and how what started as a local campaign for train safety in Australia, went world wide over night. Posted in Advertising and tagged Cannes Lions 2013 Festival of Creativity, Dumb Ways to Die, Integrated Campaign, iTunes, Tumblr, Viral Video on July 16, 2013 by Author. Tweet races, Twitter games, and Twitter based competitions are nothing new, but occasionally one comes along that really works. Case in point VW’s #polowers campaign created by DDB Spain. The numbers in the video are pretty impressive, even though the number of participants was only 4075. This collective race, generated over 150,000 tweets with the hashtag #Polowers in 8 hours averaging 5 tweets per second. On top of that the campaign reached more than 10% of Spain’s global twitter audience. In addition, the game generated a vast amount of visits to Polo´s product section on www.volkswagen.es, reaching a record of its history. The screen shot above is from the integrated website that was developed for the game. Unfortunately it has been pulled down. Posted in Advertising, Technology and tagged DDB Spain, Integrated Campaign, Polo, Polowers, Social Gaming, Social Marketing, Twitter, Viral Marketing, VW on April 25, 2013 by Author. DTM makes its return. BMW Motorsport Advertising Done Right. This week marks the countdown to the biggest auto race in the USA, The Indy 500. I’m not a huge Indy fan, nor am I a NASCAR guy. I tend to like auto racing that isn’t based on an oval track, where the cars turn more than just left. I know, all the NASCAR fans just groaned and said “He’s missing the point”. None the less I am sticking to guns and watching SCCA, Formula 1, Rally, etc. Now with that said, to help kick off this big racing week here in America, I am posting a little bit about BMW racing. Come on now, There is a lot of German heritage in this country so humor me, and this is one hell of an advertising campaign to promote BMW Motorsport and celebrate BMW M’s 40th anniversary. To introduce the BMW German Touring Car Masters team, BMW has launched a new print and video campaign built around “Welcome to the team. Come closer”. The campaign emphasizes the involvement with racing fans and offers an opportunity to experience BMW racing even more direct and unfiltered. The campaign was implemented by Service Plan in Munich and has been distributed on an international level. 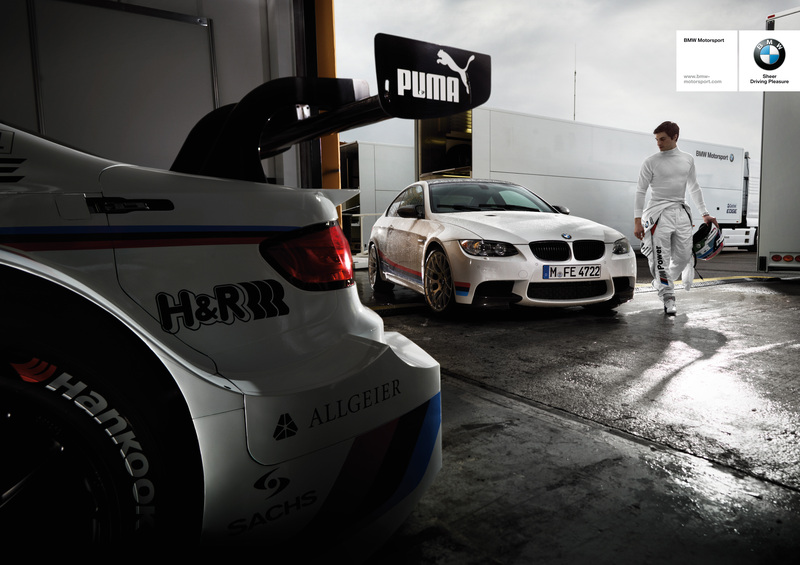 Creative Director Matthias Harbeck, says the campaign is designed to make BMW racing feel closer, more personal, intense and a dynamic show. 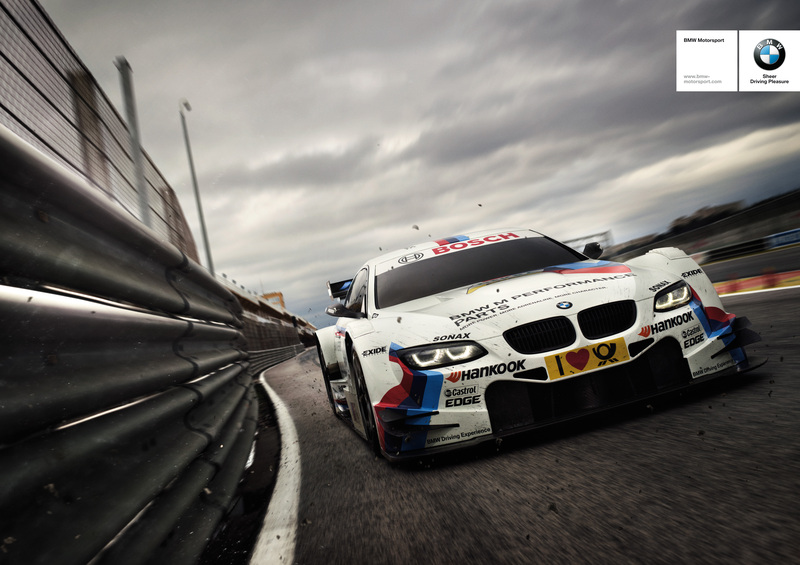 The campaign highlights the brand by bringing the excitement of racing to the fans and at the same time to differentiate BMW from their competitors. 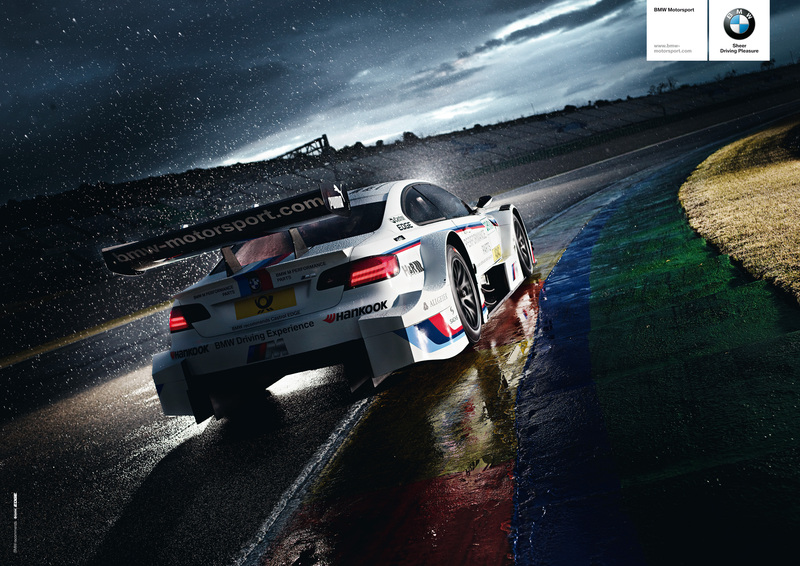 The printed portion of the campaign uses beautiful photography that highlights the racing cars on the track. Dramatic lighting and camera angles help accent the intense feeling of being at the track watching the car and drivers preform. There is a minimal amount of copy which allows the images to sell the brand. 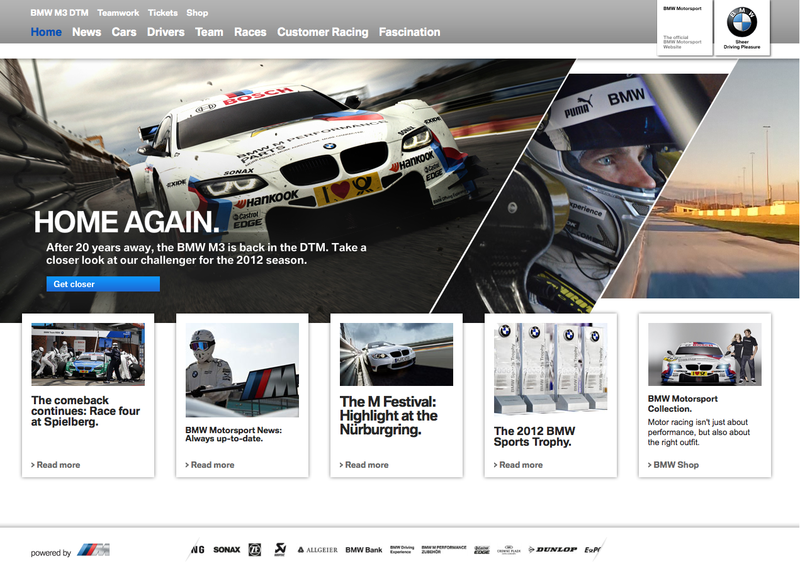 A simple call out to the BMW Motor Sport website and the “Sheer Driving Pleasure” tag line are all that is needed. The companion YouTube video has a really nice feel to it. The editing is spot on accentuating the fact that this is a team sport. There are some really nice slow motion shots of the car in action combined with re-timed footage that adds drama to the video. In addition to the video embedded here, there are 10 short films at the BMW Motor Sport channel on YouTube, including the BMW Motorsport Showroom movie. All of this is combined with posters, advertisements, autograph cards, branded ticketing agents, flyers and give-aways as well as the branded features from hospitality, to the paddock behind the racetracks. All of this is targeted to include special guests and the public. In addition to the traditional advertising materials, BMW has developed required reading for all BMW fans with a 200 page magazine titled “110%”.The magazine is available at tracks where BMW is competing as well as BMW dealers.The magazine is a glossy book that deals with all things relating to BMW Motorsport, including behind the scenes with BMW racing, driver and the team portraits, the track circuits and of course the new BMW M3 DTM. Through out the magazine there are QR codes which are tied directly to additional interactive content, and a BMW Motorsport micro sitewith even more video, images, and an on-board 3D video of the new M3 DTM in action on the track, as well as a complete pit stop action from eight different angles. Posted in Advertising, Design and Art and tagged Advertisning, Auto Racing, BMW, BMW Motorsport, DTM, Indy 500, Integrated Campaign, M, M3, Munich, NASCAR, SCCA, Service Plan on May 21, 2012 by Author. 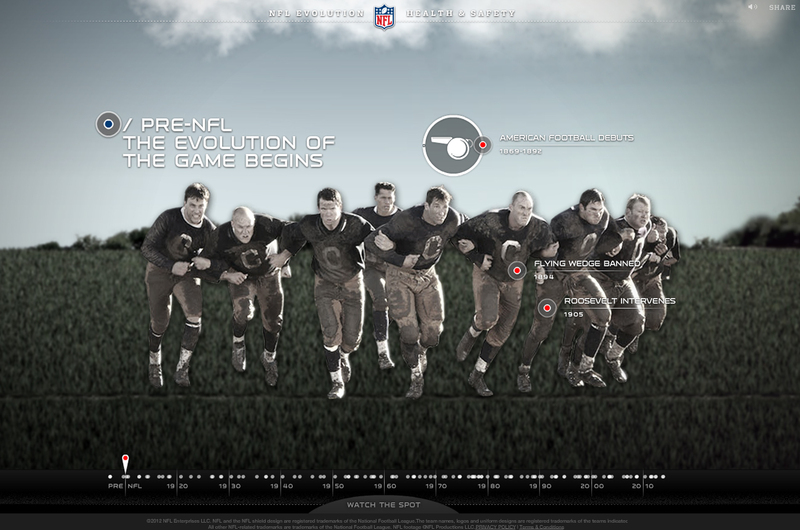 NFL Timeline Evolution of the Game Microsite. If you happened to be one of the millions that watched the Super Bowl last Sunday night you probably paid close attention to the commercials. If you were paying attention you might remember the NFL “Timeline Evolution of the Game” commercial that raises awareness about new rules and regulations that have come to be since the early 1900s. That TV spot is the center piece to an integrated campaign that includes a microsite which features a timeline of equipment and rule changes through out the history of the sport. The timeline contains interactive objects, and highlights important players from that period. Like the TV spot that this site supports, the end user scrolls through the history of the NFL from Lambeau Field to the LA Memorial Coliseum. One thing that I really like about this site is the way it could transfer into an even more expansive offering via a tablet based application like “Penant” for the iPad. Posted in Advertising, Information Graphics, Technology, Video and Motion Graphics and tagged 2012 Super Bowl Commercials, Integrated Campaign, NFL, NFL History, NFL Safety, NFL Timeline Evolution of the Game, TV Commercials on February 9, 2012 by Author.